A perennial with a stout taproot, dandelion is abundant everywhere but prefers chalks and loamy soils above pH 7.0. It has been found in prehistoric deposits, and is recorded up to 2,700 ft in Britain. 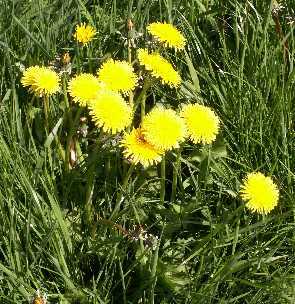 Dandelion is common in pastures, lawns, orchards, hay fields, waste ground and roadsides. It can be both a pioneer species on freshly disturbed soil and a longer-term constituent of established vegetation. It is a weed of perennial horticultural crops and gardens and may also be a problem in some annual crops, particularly where reduced tillage is practiced. The taxonomy of the dandelion is very complex. The flowers of most of the aggregate are apomictic and hence local strains tend to develop. In a recent flora of the British Isles, over 200 micro-species were recognised and grouped into 9 sections. Dandelion is eaten readily by sheep but is relatively low yielding as forage. The plants have some nutritive value in pasture and are relatively high in calcium, nitrogen, copper and iron. The fibrosity index is low compared with ryegrass. Dandelion leaves provide winter food for pigeons. The flowers are a rich nectar source for insects and the seeds are eaten by many bird species. The roots are used in medicine as a tonic and for their diuretic properties. Dandelion plants release ethylene, a chemical that can affect the growth of neighbouring plants. The plant can carry economically important viruses some of which are seed borne. Nematodes can infest it too. Dandelion flowers from May to October but most profusely in May and June. A period of low temperature seems to intensify flowering but daylength does not have a great influence. Seedlings that emerge in spring may flower in their first year. Established plants that bloom in spring can flower again in autumn. The time from flowering to seed ripening is about 9-12 days. The fruiting period is from April to June. A flower head can produce up to 400 seeds but the average is 180. A plant may have a total of 2,000 to 12,000 seeds. Cut down flower stems do not produce any viable seed. Ripe seed is able to germinate at once and gives around 90% germination. In the laboratory, germination is stimulated by light, nitrate and alternating temperatures. Seed stratified in soil overwinter will give 100% germination in the light or in the dark. The germination of seeds in close proximity to each other may be inhibited. Seedlings emerge mainly from March to October with a flush of seedlings appearing in March-April and just odd seedlings at other times. Most seedlings emerge in the first 2 years after seed has been shed. The highest seedling numbers often occur on the least cultivated areas of soil. In pasture, seedling emergence is greater when seed predation is prevented. In established plants, the taproot contracts to keep the apical growing point of the rosette of leaves beneath the soil surface. Dandelion overwinters as a small rosette of leaves. Individual plants may survive for 10 to 13 years in undisturbed sites. Dandelion seeds can form a relatively persistent seedbank. Seed in soil has a half-life of 3 months. If buried, a few seeds may still remain viable at the end of 5 years. Seeds are killed by storage at 27 °C with 80% humidity. Dandelion reproduces both vegetatively and from seed. Even small fragments of root left after plants are pulled may regenerate but thicker root pieces regrow better than thin ones. The orientation of fragments can influence survival. The time of year can also affect regeneration. Dandelion seeds are wind dispersed and may travel up to 500 m from the parent. Seeds have been recovered from irrigation water and can survive submergence for 9 months. Viable seeds have been found in cattle and horse droppings. Seedlings have been raised from the droppings of various birds. Every effort should be made to prevent dandelion flowering and seeding. The long taproot renders eradication by hoeing a slow and difficult process. The deep taproot is difficult to extract manually. In the past a tool called a ‘dandelion grubber’ was used to remove the roots completely. Cutting individual plants below ground with a blade may not be successful because any portion of the root that remains can sprout and a cluster of new shoots often develops. Regeneration and survival of root fragments is lowest at the time of maximum flowering. Dandelion can survive tillage through regeneration of root fragments but ploughing may bury the roots deep enough to prevent emergence. As a wind dispersed species, dandelion is often associated with zero tillage systems.